Although the word "skiing" was originally used as a generic term for traveling through the snow on two long boards, the sport has evolved dramatically to include many different types and styles of skiing, attracting a wide range of skiers with a variety of interests. There are many skiing options, from casual recreational skiing to racing to backcountry challenges. Most skiing disciplines are lift-serviced, though adventure-minded skiers might gravitate toward off-piste terrain, meaning skiing in the backcountry or on trails that are ungroomed or not maintained. Skiing encompasses a dynamic group of disciplines and accompanying terrain types, from flat, cross-country trails to steep backcountry slopes. Cross country skiing, also known as Nordic or x-country skiing, dates back to the days when transportation options were few and far between. If you were to study ski history, you'd see that historians date the origins of cross country skiing back to 6300 BC. Other accounts of cross country skiing date back to the mining days. In many cases, this type of skiing was used by mail carriers, such as Father Dyer in Breckenridge and John "Snowshoe" Thompson in the Sierra Nevada Range. 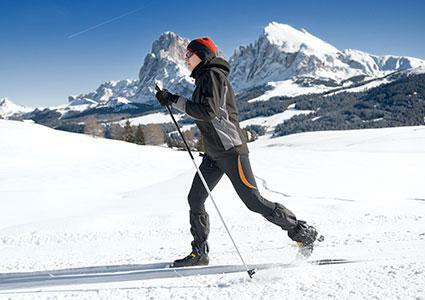 The classic style of cross country skiing involves a gliding, straight ahead movement. In contrast, the skating style is characterized by its V-shaped glide, which bears a close resemblance to the movements used in roller skating and ice skating. Cross country skiing does not use chair lifts. Additionally, unlike downhill or Alpine skiing, a cross country skier's heel is not attached to the boot binding. As its name implies, downhill skiing, often called Alpine skiing, involves going downhill. In most cases downhill skiing is lift-serviced skiing. In contrast to cross country ski boots, the heels of the heavy, plastic Alpine ski boots are attached to the ski boot binding. Alpine boots come up higher on the leg than cross-country ski boots. Additionally, Alpine poles are shorter, and the skis themselves are wider. Since downhill skiing involves using a chair lift, it is a considerably more expensive sport than cross country skiing. Freestyle skiing includes several sub-disciplines of downhill skiing, including mogul skiing, aerials, halfpipe, and snowboarding. 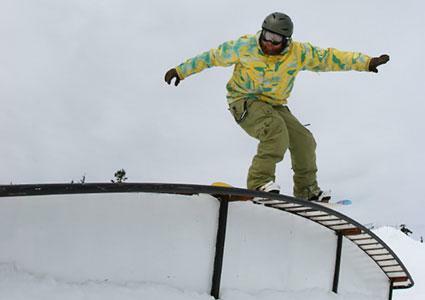 Freestyle is often performed in terrain parks, which feature a variety of jumps and various obstacles over which skiers perform tricks and stunts. Mogul is a type of Alpine skiing which involves skiing over a series of large mounds of packed snow. 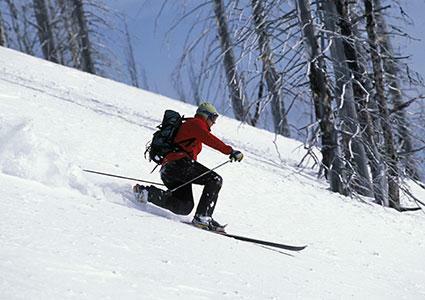 This type of skiing differs from the traditional carving technique in that it uses more rotary movements of the torso and legs. 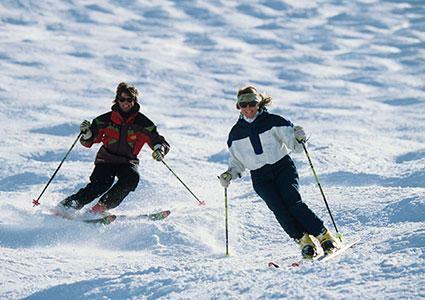 While all types of skiing involve strategy, mogul skiing pairs that with extreme concentration to navigate the bumps. Aerial skiers descend a hill, without ski poles, toward a steeply ramped jump and perform flips, twists, and somersaults similar to the type that a gymnast may perform. Aerial skiers use a special ski known as a twin tip, which allows them to ski forwards and backwards. While technically not "skiing," snowboarding is an evolution of traditional downhill skiing and is popular all over the world. Boarders cruise down the hill on a single, wide platform with both feet attached to bindings, riding like a surfer on snow. Ski resorts accommodated the snowboarding boom by building expansive terrain parks, where beginners hone their skills and experts flip through the air from jumps and halfpipes. Halfpipe skiers drop in and out of a half-circle scoop in the hill like a pendulum, performing acrobatic jumps and stunts high in the air on each successive ascending swing through the pipe. Exciting to watch and a hit with fans, Halfpipe skiing was approved by the International Olympic Committee to be an official sport of the 2014 Olympic Games in Sochi, Russia. 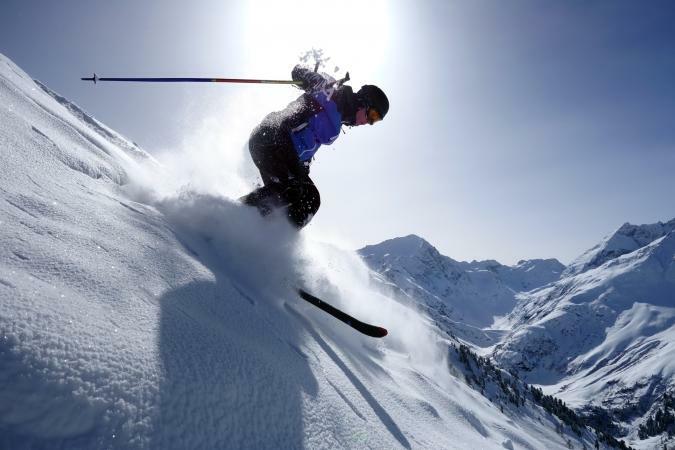 Ski racing is another Alpine discipline which involves stiffer ski boots and course-specific skis. 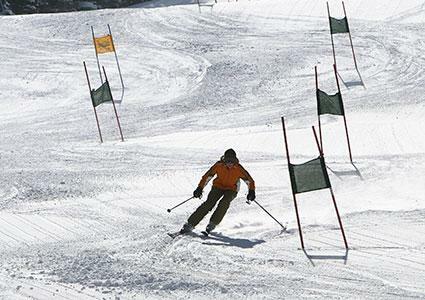 Slalom skiers cut fast, tight turns on courses marked with gates at specific turning points. Giant slalom utilizes a similar course setup, but with gates spaced farther apart to match faster speeds of skiers. Downhill skiers blaze down long, nearly straight courses at speeds up to 100 mph. Some skiers want to find their own road. They are called backcountry skiers. Backcountry skiers do not use ski lifts. Instead, they "earn their turns," as it's called in the ski industry, by hiking up the hill or venturing into areas not maintained by ski resorts. This terrain is known as off-piste, meaning simply skiing outside of groomed trails. Given that there is no ski patrol in the backcountry, skiers often carry avalanche safety equipment. Skis used in the backcountry's deep powder conditions are significantly wider than traditional Alpine skis, allowing skiers to "float" over the top of the snow. Telemark skiing is actually a cross between cross country and Alpine skiing. It is usually performed on a downhill slope. However, like cross country, in telemark skiing the heel is not attached to the ski boot binding. The movement looks like a series of lunges traveling down the slope. Since the lifted heel makes it easy to climb the hills, many telemark skiers are also backcountry skiers. 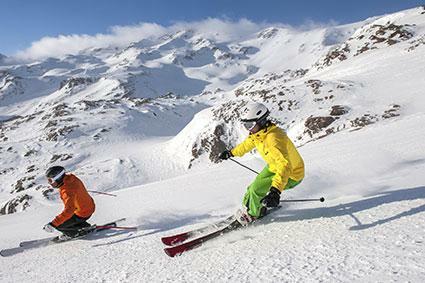 Skiing is a versatile sport with many choices to satisfy your winter activity ambitions. Cruise quiet forest trails on cross-country trails, or try competitive racing. Hit the alpine ski resorts for exhilarating days of carving turns on your skis or snowboard, on groomed or tree runs, or open bowls of powder snow. Head to the backcountry for adventure and challenge. 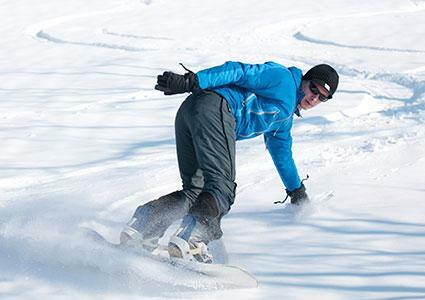 Whatever your pleasure, skiing lets you enjoy the best of winter.